We generally recommend that you consult an experienced repair technician for truss rod adjustments, but if you know what you’re doing, a Taylor truss rod wrench is a handy tool for tweaking the amount of relief in your neck. Use it to adjust for different string gauges or to dial-in the right feel for your playing style. 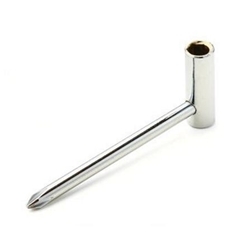 Features a ¼" nut driver on one end and a handy Phillips screwdriver at the other. Please note that Nylon Series and older Big Baby truss rods are accessed through the soundhole and require our longer wrench.